A couple of weeks ago, I was cruising around Scandinavia on the Italian ship MSC Poesia when I met a brilliant and charming Swiss man, a table mate at dinner named Egon who had booked passage on the ship for a year. Does that sound absurd? Well, I just might have fallen for Egon if I weren’t already in love and recently married, and if miles and years hadn’t separated us. Many miles and years. You see, Egon is 94-years-old. But his appeal is ageless, like a fine Burgundy or a Bach cantata or a vintage Steinway. Women and men gravitate toward his wry commentary and his clever double entendres. He tells compelling stories, but he also asks insightful questions. A rare combo. And he has the guts to live a dream. Egon spent most of his life in Switzerland and British Columbia, although he was born in Germany. The trauma of World War II makes it hard for him to talk about that time of terrible personal loss, but he talks of most anything else with honesty and vulnerability and insight. Egon was a successful importer in Canada, and is a gifted pianist and organist; he retired early to play music around the world. Last year he sold his house and goods, and he now lives in a stateroom on the Poesia, cruising his life away. 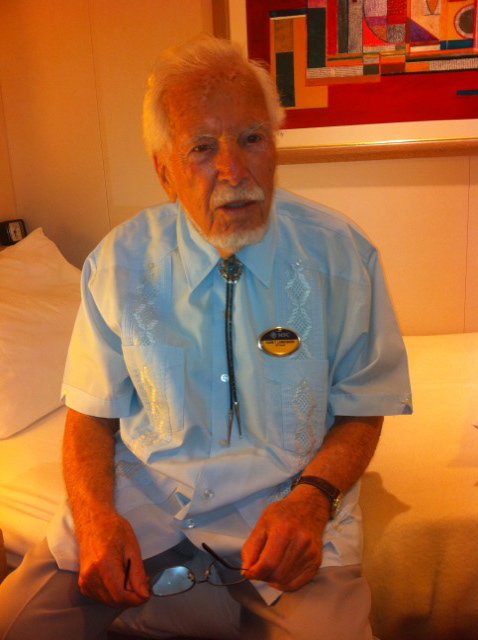 He says that the only assisted living he is ready for is on a ship. He married three times, the last marriage lasting more than 40 years until his wife died six years ago, at 87. He had his share of flings and close friendships, and a woman friend from Switzerland is soon joining him for a week on board. He swims 20 laps a day in the ship’s pool, listens to his favorite pianist, Angela, every night in the lounge, and finishes crossword puzzles before bed. He keeps a scooter in his inside cabin and scoots to internet cafes in port, where he blogs daily. On days at sea Egon plays remarkable piano in the reception area of the ship, just for the enjoyment. He knows 1500 songs by ear, and enjoys playing special requests. And yes, over several Scrabble games he demolished me, consistently racking up around 400 points (his highest one-word total in our games was 57), even though English is not his first language. Age has little to do with it: there are old souls and young-at-heart souls of varied years. And that’s often how it goes when you’re traveling: instant connections that transcend age or nationality or status. 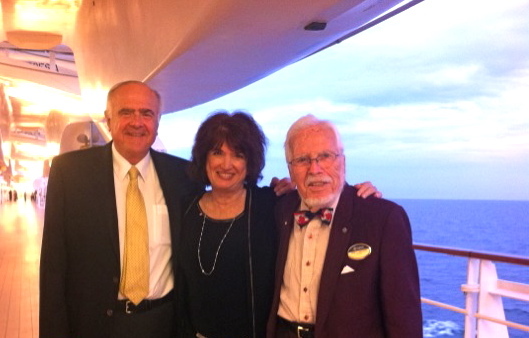 This past week on the Poesia, 44 countries were represented among 2500 passengers, and that’s not counting the crew. Only a couple dozen of us were Americans. And of these thousands of people, I’m sure that at least a few could also have been a special connection. Egon says that it’s hard to reach an advanced age when you’re aware and alert and frisky. You still want more. You’re not ready to leave. You feel like you always did, and are shocked when you look in a mirror or state your years. We talked about an after-life and he remains hopeful, but with a twinkle says that meanwhile he would love some female company, but she’d better be good at Scrabble, and like to laugh. Bill and I hope to meet Egon again at the end of his year-long cruise when the ship docks at New York harbor this September. He’d especially like to eat a good corned-beef sandwich. He’s not sure what he’ll be doing after this cruise, but says with a smile that at his age he’ll probably book in shorter segments from now on. Maybe hop a freighter or take a three-month cruise around the world this winter. But who knows? I sure hope so. Here’s to my new-old soulmate, Egon — and to good health and good seas and many Scrabble games to come, for us all. Specializing in solo female travel, Lea Lane is an award-winning writer and communicator. She hosts a TV travel show in the New York City area, writes for websites, magazines, newspapers (including The New York TImes), has authored six books (including Solo Traveler), and contributes to dozens of others. She wrote a column called "Going It Alone," for Gannett Newspapers, and was managing editor of "Travel Smart" newsletter. She is a frequent, featured blogger at huffingtonpost.com, opensalon.com and concierge.com. Lea has earned two and a half college degrees. She has been a high school teacher and college lecturer, vice president of a tech company, an actress ("Nurse One" in a low-budget indie film), an off-Broadway producer, a produced musical playwright (off-off-off Broadway), a counselor for foster children. As a writing consultant for businesses and government, she has trained over a thousand people to write better, using her book, Steps to Better Writing. Divorced once, widowed once, Lea was happily solo for most of her adult life, and recently married, proving once again that love may come when you least expect it. She has two wonderful grown sons, a lovely daughter-in-law, and two adorable little granddaughters, Sabrina Rose and Chloe Jordan. She lives in Florida when she isn't traveling the world, and writing and speaking about it. Lea Lane's goal as Solo Lady founder and editor is for viewers to realize, enhance and enjoy the many options and opportunities of solo living!